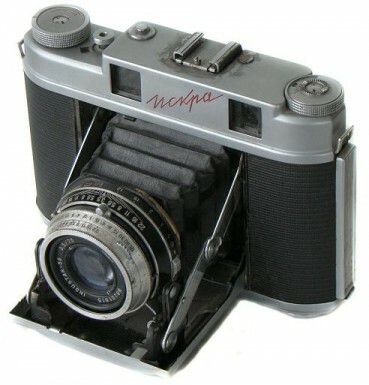 This is a modern design for a medium format folding roll film camera. It has a combined viewfinder and coupled range finder. The shutter speeds and apertures lock together and the lens is marked with "Exposure Values"(EV). 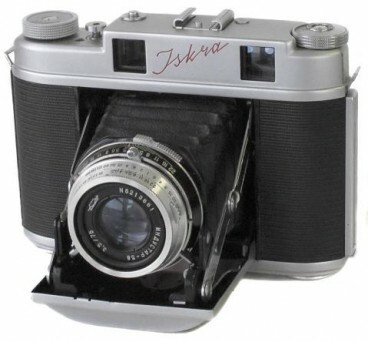 This camera has a brown eveready leather case with chrome trim around the top and bottom and Iskra on the lens cover . Shutter: 1s, 1/2s, 1/4s, 1/8s, 1/15s, 1/30s, 1/60s, 1/125s, 1/250s, 1/500s + B.
PM7605. 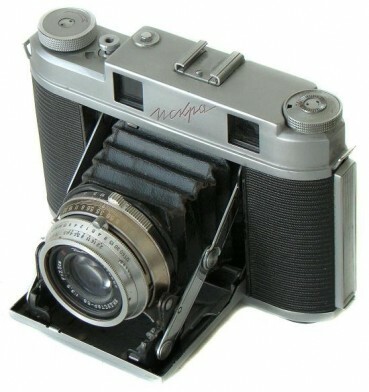 An earliest so far known version of the particular camera. Very few prototype cameras released in 1959. Comes without adjustment bolt on the top plate yet. 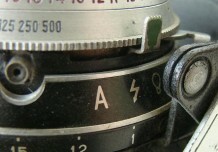 An old flash synch markings on the shutter (see picture below). An earliest so far known camera has s/n #6000110 (private coll.). PM7610. 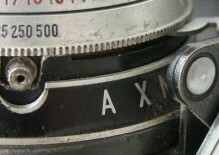 Camera identical to PM7605, but with new flash synch markings on the shutter (see picture below). Released in 1960 only. PM7615. 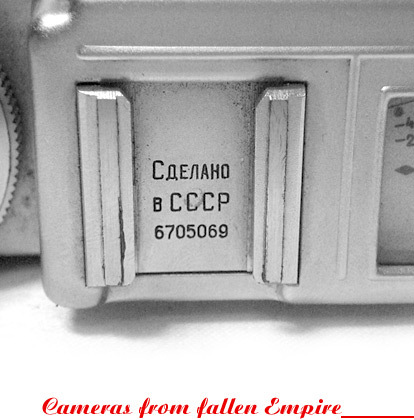 Although this camera #6000132 is one of the earliest Iskra cameras known so far, it's already comes with new flash synch markings on the shutter as on Iskra-2 camera (see picture below). Camera opposite from Ilya Stolyar (USA) coll. PM7630. 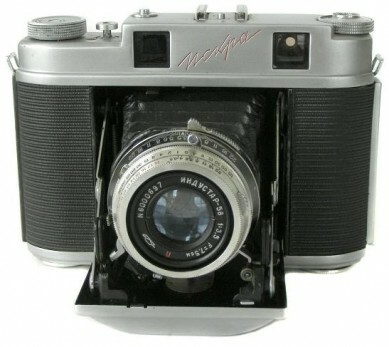 Camera identical to 1st version, but with adjustment bolt on the top plate already (see picture opposite). 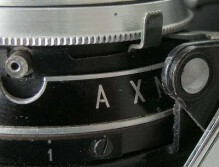 New flash synch markings on the shutter as on Iskra-2 camera (see picture below). Released in 1960-1963. PM7635. An additional "SDELANO B CCCP" markings on the rear plate. No otherwise different from PM7630. PM7640. Camera identical to PM7630, but with old flash synch markings as on PM7610 (see picture below). Released in 1960-1963. PM7645. An additional "SDELANO B CCCP" markings on the rear plate. No otherwise different from PM7645. PM7650. 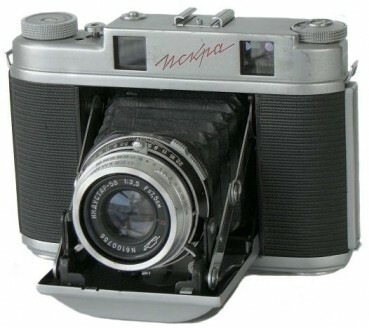 An export version of the particular camera (2nd version), under name "Iskra" in Roman characters. 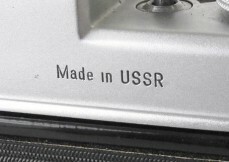 "MADE IN USSR" markings on the rear plate (see picture below). An earliest so far known camera has s/n #6201836 (eBay, 2010). Less common to find. Camera opposite from Ilya Stolyar (USA) coll.